I don’t believe anyone actually responded. How can you respond to something like that? (I mused later that I could have asked, “How can you stand coming down here and talking to people? You have to talk to people all day!”) Of course, the obvious answers have to do with the fact that people who are drawn into editing often like to read, and reading and editing manuscripts is altogether different from reading finished work that has nothing to do with our association. This week, I thought back to this incident when someone sent me a link to Jonathan Veitch’s convocation address at Occidental College. Veitch says that after he graduated from college, he noticed that many of his friends who had been serious students did not have books in their new post-college homes. Reading was no longer part of their lives. I can’t imagine a life without reading. Even though I haven’t always read as much as I have this year, I’ve always had a book on the go, and I’ve always had plenty of books in the house. Why is reading so important to me, when others seem able to take or leave it? In the film version of Shadowlands with Anthony Hopkins, one character says that “we read to know we’re not alone.” That is a large piece of why I read. As a socially awkward young girl, I read lots of YA fiction about girls who struggled to make friends. It helped me immensely to know that I wasn’t the only one. Even now, books like Portrait of a Lady move me in part because I can see myself and my own struggles within them. I know that I’m not alone, and I get a new perspective on how to think about my life. But my reading is not all about me. I also read to learn about places and people who aren’t like me. Up until two years ago, I had never traveled outside the United States (unless you count Niagara Falls, Canada, which I don’t because I could see the United States the whole time I was there). Books provided a window to worlds I hadn’t been able to see for myself. I realized how important this was several years ago, when one of my friends who has traveled to and lived in many different places called me one of her more “worldly” friends, meaning that I know about other places and always want to know more. Reading is what did that. Some of the items on display in the wonder cabinets were patently false: mermaid’s tails, drawings of two-headed men, fierce Amazons and fantastical beasts. But all of the items—real or false (and often it was hard to tell the difference)—were treated as objects of fascination, the subjects of lengthy discussion and even reverie. I’d like to propose that you think of your bookshelf that way—as something of a wonder cabinet filled with exotic ideas, maps of continents that never existed, language as gorgeous and iridescent as the shells brought back from the South Seas. The immediate utility of these things may not be readily apparent, but they are prods to the imagination which encourage us to think beyond the well-trodden ground of our contemporaries. I love that idea. My bookshelf is where I store my wonders. I realize that books aren’t the only way to understand ourselves or the world. I have many dear friends who aren’t readers but who are interested in the world, but for me, nothing engages my mind and soul like a book. That’s why I’m a reader. How about you? P.S. 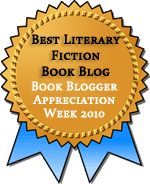 Thanks to all who stopped by during Book Blogger Appreciation Week. It was great fun discovering new blogs. Like others, I’m feeling a little overwhelmed by all that’s out there, but it’s great to see that there is so much conversation about books on the Web. Ice Land by Betsy Tobin. A fun read about Norse mythology and Icelandic history. Infinite Jest by David Foster Wallace. Brilliant, but excessive. Midnight in the Garden of Good and Evil by Jon Berendt on audio. The Little Stranger by Sarah Waters. Booker shortlister #2 for me. My first Waters novel. I’m hoping to finish this today. The Ode Less Traveled by Stephen Fry. Lessons in writing poetry. I’m writing tercets about tercets. Comfort Me with Apples by Ruth Reichl on audio. A foodie memoir from the library. Vanilla Beans and Brodo by Isabella Dusi. A memoir about life in Tuscany. Reading for book club. Wolf Hall by Hilary Mantel. This seems to be the current favorite to win the Booker prize, and it will be my first Mantel. The Harrowing by Robert Dinsdale. Via Bookmooch. I first learned about this WWI novel at Reading Matters. Crossed Wires by Rosy Thornton. Copy from author. Despite the aggressively pink cover, the reviews I’ve seen lead me to believe that this could be a nice light read for after the Booker-thon is over or when I’m working on my historical theology paper later this fall. The Weirdstone of Brisingamen by Alan Garner. In the comments on my Ice Land review, Ann said that this YA books with roots in Norse myth scared her as a college student. After Ice Land, I want to read more Norse myth, and I love a good scare. Unbelievable: Investigations into Ghosts, Poltergeists, Telepathy, and other Unseen Phenomena from the Duke Parapsychology Laboratory by Stacy Horn. Eva at A Striped Armchair didn’t love this because it was more focused on telepathy than on ghosts, but I’m intrigued by that idea. The Moon of Gomrath by Alan Garner. The sequel to The Weirdstone of Brisingamen. Zeitoun by Dave Eggers. Nonfiction about a man with a canoe, Hurricane Katrina, and the upsetting events that followed. Reviewed at Books to the Ceiling. Gabriel Josipovici. Litlove’s review of After and Making Mistakes is the first I’ve heard of this author, but I must read him now. Where Men Win Glory: The Odyssey of Pat Tillman by Jon Krakauer. I almost always enjoy Krakauer’s writing, and this book sounds like an interesting, albeit upsetting, one that is as much about media manipulation as about Tillman’s tragic death in Iraq. Fairy Tale by Alice Thomas Ellis. I remember wanting to read Ellis’s Sin Eater years ago, but I can’t remember if I ever actually found it. This review at Desperate Reader reminded me of her work. I’m Looking Through You by Jennifer Finney Boylan. Eva of A Striped Armchair was swept away by this memoir of a transgendered woman’s childhood in a haunted house. Those are my two main reasons for reading as well. There’s something very comforting about having our own experiences confirmed by books. “Confirmed” is probably not the right word, but you know what I mean. It does make me feel much less alone. And then there’s having access to lives and experiences that are completely different from my own; to situations, cultures and contexts I’d never have any contact with if not for books. Someone once said that readers live more lives, and I think that in a way that’s true. I want to read The Weirdstone of Brisingamen as well. I really loved Alan Garner’s The Owl Service. I simply love that idea of a wonder cabinet and the tie to my book shelves. Reading is like going to a party where you never know who you will meet and what the evening might hold. It is it’s unpredictable nature that I value I think. We hold much in common in our book futures. Happy reading! That’s such a beautiful quote! The wonder cabinet is a fabulous analogy to how I view my books and my bookshelves. I really can’t fathom people who don’t read all the time. I don’t understand it! I guess people are baffled that I don’t watch TV! I get that same spiel all the time from people I know. How can you read so much? How do you find the time? I don’t have time to read! I always respond: do you watch TV? Do you get on the internet for hours at a time? Do you find time to do the things you truly love? Well I truly love reading and I wouldn’t give it up for anything. Comfort Me With Apples has such a darling title, I can’t wait to hear what you think about it! I’m quite taken with the idea of a wonder cabinet. My books are wonder cabinets. I, like you, mull over this question a lot. Why don’t others find reading a most compelling experience? I actually pondered this aloud last week at my blog. I’m a librarian, so I get lots of rolled eyes about the amount of reading I do, both at work and at home. I actually gave up tv in 2003 so that I could read more. What a lovely and thoughtful piece, Teresa! I really don’t think I could imagine my life without books – reading keeps me from becoming mentally sluggish, it nourishes me. I read to expand my mind, to learn more about the world, about the people in it. I read in order to soar to extreme heights as well as plumb very dark depths as well. With a book, there are no boundaries, neither in time nor space. I read because I can’t imagine NOT reading. I know that there are people who have to run freakish amounts of miles every day simply because for them it’s like a biological imperative. For me, that’s what reading is! This is a lovely post and it makes me said that people give up reading after school or because other forms of “entertainment” take their attention. Like Frances I love the idea of the connection between books and a wonder cabinet. I am adding Ice Land and the Alan Garner books to my TBR list. Nymeth: I was in a writing workshop years ago, and a fellow participant talked of finding “a companion on the page.” I think that can be so helpful in validating our own experiences and feelings. Frances: Expect that a book is a party I’m apt to enjoy, and if I don’t I can “leave” without offending my host! Lu: People ask me the same thing, and as we talk about it, it’s often evident that we just make time for different things. I’m usually out of it when it comes to TV. I wonder how people find time for that! debnance: I’ve given up TV for the most part. I get my two discs from Netflix, which is usually plenty to fill my TV/movie cravings. People do think that’s strange. Steph: Right. People do usually find a way make time for the things that are most important. I’m sure there will be times when I can’t manage a book or two a week, but I can’t imagine not reading at all. It would be like giving up breathing. Gavin: Thanks! The saddest thing about the story that I linked was that these people were once serious readers. In a way, that seemed sadder than people who never got into reading at all. The folks who gave it up knew what they were missing. Interesting post. I think people who proudly say ‘I don’t read’ are actually afraid of reading. They prefer to be conservative and play ‘safe.’ Shame, but it takes all sorts. Loved this post! And the idea of a wonder cabinet. :) My brain’s too fuzzy to reply any more intelligently right now, though. I love the idea of my shelves as a wonder cabinet – that’s delightful. I’m just a compulsive reader. Or perhaps I should say I’m a literary hedonist. I’ve never found another pleasure quite like it. And having spent my entire working life with books and reading, I can’t imagine not exercising the muscles of the imagination. I’d be bereft! Nicola: Interesting thought. I do think there are plenty of people who want to avoid a mental challenge, and so they avoid reading. Eva: Thanks! The wonder cabinet is a great image. litlove: I have so many things I enjoy, but very little that brings me as much pleasure as a good book. I read because … what else in the world would I do with myself? I can’t imagine how bored I’d be with no book to read! It’s hard to think about why I read, actually, because it feels so natural, like breathing. Dorothy W.: My sentiments exactly. It’s like breathing. I love this post! I can’t imagine what I’d say to someone who said that. I feel very similarly to you, although I don’t think I have anything else to add. Lovely post Teresa, I like the idea of a bookshelf fof wonders and am off to read Veitch’s address. That Shadowlands quote about reading to know we’re not alone has been pinched from that childhood favourite, C.S. Lewis. I hope you’re enjoying The ode less travelled, I did although sometimes struggled with the exercises! Kim: When I graduated from college I probably read as much as I did in college, but the nature of my reading changed. I went from almost nothing but classic lit (I too was an English major) to almost nothing but thrillers, mysteries, and YA. It took a while before I started reading classics for fun again. But, yeah, blogging has ramped up my reading considerably. adevotedreader: I know I’ve seen that quote attributed to C.S. Lewis, but I’ve never run across it in his writing (not that I’ve looked particularly hard). I wasn’t at all sure if it’s put in his mouth in Shadowland and people assumed it was him or if he actually said it. And, I’m enjoying The Ode Less Traveled, but I’m finding that the deadfulness of my poetry is becoming the primary topic of my poetry! We’ll see if I’m brave enough to share examples when I review it (which won’t be for a while–I’m going very slowly).